Pro-Ject Essential review | What Hi-Fi? Pro-ject has dominated the budget turntable market for more years than we care to remember. With the Award-winning Genie's price rising (blame the exchange rate and increased manufacturing costs) the company has developed another product to take over the entry-level mantle. That deck is the Essential. The price point suggests a minimum of frills, and so it proves. There's no sub platter here – the drive belt spins the main platter directly – and the Essential deck has little in the way of isolation. Highlights include a new arm of unipivot design, a surprisingly tightly toleranced main bearing and the inclusion of Ortofon's OMB 3E cartridge, which is a decent budget performer. 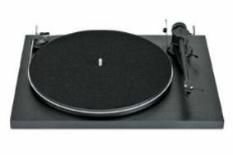 Pro-ject found that some people were put off by the Genie's lack of lid, so the Essential comes with one. Once properly set up on a rigid support (ideally well away from the speakers), this package turns in an excellent performance for the money. It doesn't matter whether you listen to REM's Automatic for the People or The Sorcerer's Apprentice by Dukas, this little Pro-ject delivers the sound with infectious enthusiasm. Yes, it's not the most pristine sonic presentation you'll ever hear, but all the fundamentals are in place: timing is crisp, while dynamics are well developed and forceful when required. Details levels are good, and rarely does the turntable sound flustered, even when it's asked to replay something demanding. Considering the price point there's little of substance to criticise here. The Essential is decently made, easy to set-up and sounds great. You can't ask for much more than that, especially at this price level.